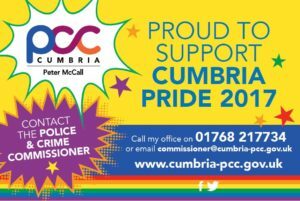 Cumbria’s Police and Crime Commissioner Peter McCall will be joining other guests, families and entertainers at this summer’s Cumbria Pride event in Carlisle (Saturday 16 September). Cumbria Pride is a family-friendly community event based in the city centre, full of music and entertainment and information for young and old, in celebration of the Lesbian, Gay, Bi-Sexual and Transgender community. There will be a host of local entertainers and national artists for everyone to enjoy. The event opens at noon and goes on until 6pm. Peter McCall said: “I am looking forward to joining the fun at Cumbria Pride on Saturday. If previous years are anything to go by, it will be a great day for entertainment and education. As well as a fun day, Pride is about celebrating diversity and a recognition that hate crime and discrimination of any type whether directed at the LGBT community or any other is unacceptable. Pride is a great way to demonstrate how we can all enjoy a great day irrespective of gender, sexuality, race or age. Police Constable Ian Garratt (Chair of Cumbria Police LGBT Staff Association) said: “I’m delighted to see the event being supported by people throughout the county and within the police force, and it’s great to see our own Police and Crime Commissioner coming along to support the event. “There is some fantastic work being done in Cumbria at the moment to challenge anti-LGBT behaviour and to increase awareness of hate crime.